Hello everyone! I'm so excited about December and doing crafts with my students. December is an emotional time of year for my families and I love working on building memories. I hope you enjoy this as well. So many crafts to do related to the common core. Here is one of the fun Christmas Tree crafts that I found on Pinterest! The picture to the left is one of my favorites from colorsofmyday.wordpress.com! The picture on the right is what we started creating today for one of our math centers. Our learning target was to design a tree using triangles and a rectangle. They were to decorate their trees with different types of art materials. They are also to describe the triangle and rectangle and tell the difference between the two. Tomorrow they will use a brush technique to dob snow all over their paper using white paint. If you click on the picture, it will take you to my Pinterest page full of Christmas Crafts activities you can do with your students during this wonderful season. Here is the final version with snow on them! :-) I love how they turned out. 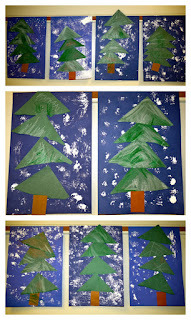 The kids really enjoyed creating these trees! Another math learning center came from one of my products: Decentas y unidades. Here the students are using shapes to create a design. We are focusing on the number 10 this week, so they can only use 10 geometric shapes. This was hard for some as they really wanted to add more shapes to "FINISH" their pictures. I told them that they can only use 10 shapes! Next week they would create another design using 11 shapes. On the back side of their page they have to show 3 other ways to create "10." Writing numbers 1-10, writing equations that equal 10, and then gluing a popscicle stick down and gluing 10 beans to their stick. It was a hit and the kids really took their time. And Tis the Season to give... here is a link to all of my Freebies on my TPT page! :-) Merry Christmas everyone! I hope you all have a wonderful and joyous season!